This unit is in good condition, it has been loaded with Linux Mint 19 and LibreOffice for testing purposes. Windows is not loaded on the unit. There is 2 pieces of plastic missing and a crack in the bezel around the screen, see pictures. 5 out of 5 stars - Lenovo ThinkPad Edge E531 Core i5-3230M 2.60GHz 4GB RAM 500GB HDD 15.6" Linux:)! 4 product ratings4 product ratings - Lenovo ThinkPad Edge E531 Core i5-3230M 2.60GHz 4GB RAM 500GB HDD 15.6" Linux:)! (1x) Lenovo ThinkPad X130e AMD 1.65GHz. What started simply as a Lenovo and Linux enthusiast’s custom build request is quickly becoming a highly demanded product. (1x) Linux OS. HDD128GB SSD. Cracked bottom panels were replaced on most of the units along with RAM sticks. This unit is in good condition, it has been loaded with Linux Mint 19 and LibreOffice for testing purposes. Windows is not loaded on the unit. There is a small crack on the right side right above the charging port. This Lenovo 3000 N100 is in refurbished condition. There may be minor surface marks, scratches, and/or dents from normal use. AS IS, sales are final. NOTE: The password on these computers, is: password. This unit is in great condition, it has been loaded with Linux Mint 19 and LibreOffice for testing purposes. Windows is not loaded on the unit. See Picture. I have tested all of the USB ports, and all work. I have owned this laptop for about one year and haven't used it very much. Lenovo ThinkPad X220 laptop (NOT the tablet version). 128GB Samsung PM871 2.5" SATA SSD. There are normal light scuffs, scratches, nicks, etc. from use over the years. Ending Saturday at 5:28PM PDT22h 57mType: Notebook/LaptopBrand: LenovoProcessor: Intel Core i5 2nd Gen. This laptop is refurbished and in good working order (grade B-C). There are scuffs/marks from general use. This tablet is fully functional like new, ready to work with your Office programs! It has a Windows-like graphical user interface and many programs similar to those found in Windows. T440 i5-4300M 1.9GHz 4GB RAM 500GB HDD. T430S i5-3320M 2.6GHz 4GB RAM 500GB HDD. T420 i5-2520M 2.5GHz 4GB RAM 320GB HDD. Nice used condition. Here are the specs. Condition is Used. IT DOES NOT HAVE A WINDOWS COA. It runs 32-bit Linux-Lubuntu 18.04. Ending Apr 23 at 7:40AM PDT3d 13hType: Notebook/LaptopBrand: LenovoProcessor: Intel Core i5 1st Gen.
Up for sale is a Lenovo Thinkpad T420s, that has been fully tested. Unit has scruff and scratches from wear and tear. Model: Lenovo Thinkpad T420s. Hard drive:128GB SSD. Optical drive: Yes. It's an open-source free system that's similar to Windows, is easy to use and will do most simple tasks right out of the box as well as give you an instant indicator of the pc's health and usability. Lenovo Thinkpad T540p. Hard Drive: 128GB SSD. 4GB DDR3 (1 x 4GB RAM). 1 x Lenovo Thinkpad Laptop. WiFi & Bluetooth. Ports: USB, VGA, Mini DisplayPort, Ethernet. Built In Web Cam. Scratches and scuff marks on surrounding area of laptop. This unit is in great condition, it has been loaded with Linux Mint 19 and LibreOffice for testing purposes. Windows is not loaded on the unit. There are scuffs/marks from general use. Small plastic guides for lid missing. It has a Windows-like graphical user interface and many programs similar to those found in Windows. The distribution's ultimate goal is to provide a Linux alternative to Windows and let Windows users enjoy all the features of Linux without complications. Hey, Linux Beginners -. Right out of the box you can HDD - 500GB. With Linux installed, this computer is ideal for Linux Mint 19 "Tessa" is installed. Linux Mint 19 "Tessa" installed. POWER - Lenovo 65W AC Adapter. Laptop is in USED condition but works great! Battery life is fair due to usage. VGA & HDMI port. SD Card slot. These are in good shape, they have Linux Mint 19 and LibreOffice for testing purposes. Windows is not loaded on them. You can still use them. They all work. See pictures. This laptop also is missing a couple of plastic pieces on the corners of the unit. There are scuffs/marks from general use. Small plastic guides for lid missing. Hard Drive: 256GB SSD. This tablet is fully functional like new, ready to work with your Office programs! Model: ThinkPad X230T. Lenovo ThinkPad T530 15.6" i7-3520M @ 2.90Ghz 8gb Ram 500gb HD Linux Mint O.S. Lenovo ThinkPad T530. 8gb Ram 500gb HD. The touchpad does have wear but functions properly. Good condition. LENOVO ThinkPad T440s Type:20ARS0PW00. Model Number ThinkPad T440s Type:20ARS0PW00Search for Similar. 160 GB SSD. INV#QMJW78. Total Ram: 1 GB. AC Adapter Included. Display Size 14.1 LCD with 1920x1080 resolution. Processor : AMD Ryzen™ 7 PRO 2700U (2.2GHz, up to 3.8GHz Max Boost, 4MB Cache). This Thinkpad Has a manufacture date of 3/19. Has been powered and fully tested. Good condition overall. Has a scratch on top of casing as pictured. 320GB Hard Drive. Storage: 320GB. Fresh install of Linux Mint 19 32-bit. - 4GB DDR2 PC2-5300 @ 667MHz. OS: Linux Mint 19 "Cinnamon" 32-bit. We have two identical units available. The listed price is for each laptop. It has been tested, cleaned, and the OS Linux Mint has been installed. Specs are below. - 500GB 7200rpm Hard Drive. Fresh install of Linux Mint 19 64-bit. Storage: 500GB 7200rpm. - 8GB DDR3 PC3-10600 @ 1333MHz. Lenovo SL410 (2842-K3U), or similar. Linux 2000, XP, Win7, Win8, or Win10 - use Linux with a Windows interface. This computer isfast using this version of Linux (a lighter version of Debian)! WINE installed so you can install and run many Windows programs inside Linux! There are scuffs/marks from general use. Small plastic guides for lid missing. Hard Drive: 256GB SSD. Note, that not all ThinkPad features/buttons may work with Zorin OS if the driver is not available or installed. 32GB Serial ATA Flash Drive. -DVD-ROM Drive (works). - lcd back screen and palm rest were covered with Carbon Leather Cover Skin. See last pictures before they were covered. -Finger print. -AC power adapter. Lenovo T61 (76641KU). Everything works great. No major dings/scratches. No dead pixels or LCD artifacts. Will run Windows, but has Linux Mint installed. Nvidia NVS 140M with 128 MB RAM. The casing on the back does have a crack and peice missing by the cd tray but that does not affect how it runs see pictures above. LENOVO ThinkPad L440 Type:20ASS04M00. Model Number ThinkPad L440 Type:20ASS04M00Search for Similar. 160 GB SSD. Display Size 14.1 LCD with 1600x900 resolution. Built in Bluetooth. Wireless Card / Bluetooth. It has been tested, cleaned, and the OS Linux Mint has been installed. Specs are below. - 320GB Hard Drive. Storage: 320GB. Fresh install of Linux Mint 19 32-bit. - 4GB DDR2 PC2-5300 @ 667MHz. OS: Linux Mint 19 "Cinnamon" 32-bit. 500GB HDD, Ubuntu. Optical drive cover. Once you have successfully reached the checkout page, simply follow the instructions from there. Minor scuffs from usage. Windows COA. What'sNO T Included. (Lenovo Thinkpad T61. ★ 250GB Hard Drive - Western Digital Blue Scorpio. ★ NO CD-RW Drive Drive is missing! Laptop is in great condition except for normal wear. Sorry the pics aren't great.but I'm a computer geek not a photographer ;-). Up for sales is used lenovo thinkpad T61 laptop core 2 duo cpu tested and working. - Linux Mint Installed. Wifi Included. Battery included and working but no warranty on life of used battery. Type : 6465. Hard Drive: 320GB. 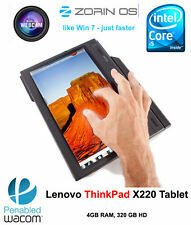 Product Line: ThinkPad. Interfaces: USB 2.0, eSATA, VGA, HDMI, Headphone/microphone combo jack. Battery: YES. Model: Edge 0301-8GU. LENOVO ThinkPad T420 Type:4177CTO. Model Number ThinkPad T420 Type:4177CTOSearch for Similar. BackLit Keyboard Hard Drive. AC Adapter Included. Display Size 14.1 LCD with 1366x768 resolution. Built in Bluetooth. Lenovo Thinkpad T440 ultrabook. 8GB RAM, 128GB SSD, webcam, Bluetooth. Thinkpad SERIAL NO:PB-03GNOF 14/08. Linux Mint 19.1 Cinnamon 64bit installed on the system. The pictures are of the actual item (s) that you will receive. This is for a Lenovo B50-45 15.6in. Laptop running Linux Mint. This is running Linux Mint 19.1, it has a 60GB SSD Hard Drive, and 6 GB of RAM. 160GB HDD. -Screen Resolution:1440 x 900. This unit have been fully tested and are fully functional. LCD hinges are tight. - Linux Mint installed. Type: 7665. Lenovo ThinkPad L420 Intel Core i5 2540M 2.60GHZ 4GB RAM 500GB HDD 14"
Model Number Lenovo ThinkPad L420 Form Factor Laptop. ThinkPad Condition. Hard Drives Installed 1 Total Capacity 500GB. RAM Installed 4096MB (4GB) Maximum RAM 16384MB (16GB). RAM Type DDR3 RAM Speed 1600MHz.